Is there still a market for rear-projection TVs? In recent months, three major manufacturers have reportedly withdrawn from the rear-projection TV (RPTV) market. Hitachi, which no longer supplies rear-projection TVs in Europe anyway, has made the same move in North America, focussing instead on LCD and plasma. In early December, another Japanese company, Epson, said it would follow suit and concentrate on its standalone front projector products. Sony became the third to announce an impending withdrawal from rear-projection, after cutting its US sales target for RPTV for 2007-08 by 43 per cent. The traditional UK or European living room barely has space for rear-projection TVs. Sets typically exceed 40 inches, and are usually 50 to 70 inches on the diagonal. But unlike plasma, they are closer in terms of picture quality to bulky cathode-ray tube TVs than svelte wall-mountable flatscreens. 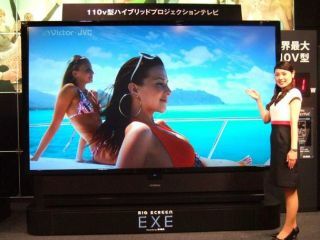 LCD TVs have been increasing in size to rival plasma at around the 40-50inch scale. A general price crash in the flatscreen market means that these once pure luxury items are now more affordable to the masses and so close in cost that there’s barely a gap between them. Research by GfK reported that in the year to October 2007, 6.1m LCDs, 1.5m CRTs and 600,000 plasmas were sold in the UK, compared to just 20,000 rear-pro TVs. In a way, this is a shame. Rear-projection TVs don’t suffer some of the drawbacks of LCD, such as limited viewing angles, slight image blur and lack of deep black levels; nor do they suffer screen burn like plasma, which is RPTV’s only realistic rival in 50inch-plus sizes. The format’s technology has kept apace with current developments, such as readiness for HD and 1080p resolutions, using high-contrast projection via DLP (digital light processing) or LCoS (liquid crystal on silicon). And while rear-pro has suffered a bashing, it’s premature to write the format’s obituary just yet. Saved by frickin' laser beams? Rumours have resurfaced that Mitsubishi and Samsung’s laser-based DLP TVs, first mooted around 2005, may be ready to go on sale later in 2008. Replacing a normal bulb with laser-driven backlighting means more durable TVs, which will also show a much greater colour gamut (about three times as much as conventional sets and covering 90 per cent of the colours human eyes can see). This new breed of RPTV can also be slightly slimmer than older models (down to about 20cm deep compared to 40cm for some models). Laser DLP TVs will cost relatively little to make and use much less energy for the consumer too. So, if you’ve got the floor space, it might be worth keeping an eye out for where rear-projection is heading. Then again, with the popularity of LCD technology now outpacing plasma, even laser TVs might be too little, too late to save RPTV.